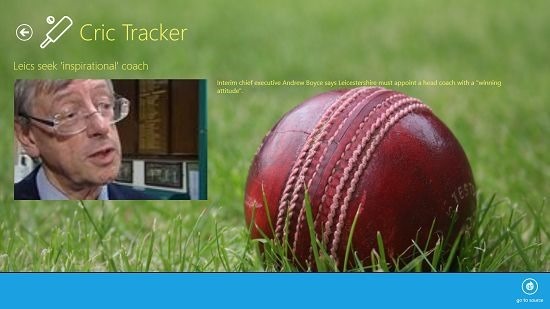 Cric Tracker is a free app for Windows 8 and 8.1 which lets you access information like scores, etc. related to cricket on your device. When you open up the app, you can read about the live scores, news items, etc. about cricket. All the items are sorted under various category groups, each of them being available in a metro interface styled tiles. The app does require an active internet connection to run, and if you don’t have it available at times when you want to check stuff like live scores etc., you might want to give this app a pass. The app has a cool interface and this will instantly become known to you as soon as you fire it up post its installation on your device. You can see my point by taking a look at the screenshot below, which shows the main interface of the app. Here, you can scroll to the right to access the various categories of the app. You can browse and read about the different content available in the app by clicking on the tiles that correspond to the same. For instance, if you click on a tile under the Live Score section, you will be able to see the live scores of various teams and you can also read a bit about the match which is going on. 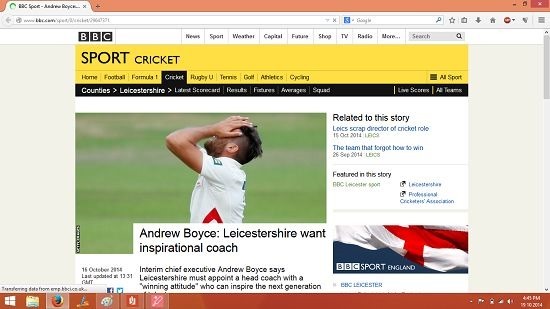 Similarly, clicking on a picture of a Top News tile, will display the details about the news item. You can see the news in brief in the reader interface, or you can also choose to view the source of the same by clicking the Go to source button on the control bar at the bottom of the screen. When you choose to visit a source of the news, your default web browser fires up pointing you to the source of the news. You can see this demonstrated in the screenshot below. The app also has various videos which you can view or access by clicking on the tiles of the videos from under the Videos category. When you do so, you will be presented with the video player interface. You can choose to resize the videos via the white button at the bottom right of the screen. 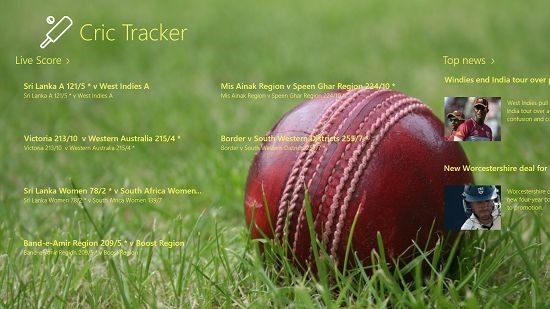 Cric Tracker is a well designed app which lets you access a lot of information related to cricket, right from live scores, to news items to blog posts. The app makes for a great way to stay in touch with your favorite game, and hence is definitely worth a download on your device.